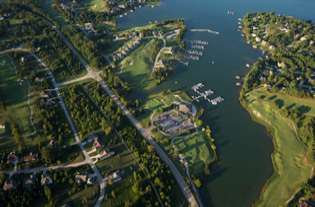 Below are our Lakefront Home Sites, located on beautiful Tellico Lake, which offer a variety of location, sizes and pricing. Please click on any photo or More Info button to be taken to a virtual tour or other informational page for more property details. This one of a kind Tellico Village lakefront lot is nestled at the foothills of the Smokey Mountains. Located on the Tellico River this point lot is 3.63 acres with over 400 feet of shoreline and contains a historical 1812 Civil War era site. This lot offers abundant space, privacy, and sweeping views of the lake and mountains. Located in the prestigious community of Bay Pointe in Rarity Bay, this main channel home site with PRIVATE DOCK RIGHTS is nearly an acre with unobstructable views. Rarity Bay is a golf and lake front community with restaurant, club house and fitness amenities. PRIME LAKEFRONT LOT IN TELLICO VILLAGE. This is one of 2 adjoining Beautiful wooded, main channel Lakefront lots for sell by the same owner. These lots are both dockable. Absolutely beautiful gently sloping lake lot in the North end of Tellico Village Village! Almost half an acre. Nice large hardwood trees. Also located in the Tanasi Golf neighborhood of Tommotley Coves. Cul-de-sac location. 125′ of water frontage. Lakefront lot for sale in the beautiful golf community of Tellico Village. Located in the north end of the Village with hardwood trees. One of a kind Dockable Lot in Tellico Village – Kahite neighborhood. This oversize lot has enough room to build your dream home. Kahite has many amenities to enjoy and is a very close knit community. A MUST SEE FOR THIS PRICE! One of the few level, dockable lots in Tellico Village with over 125′ of shoreline located on a cul-de-sac with very high end homes. The lot has a mix of mature hardwood and pine trees and is .34 acres. The opportunities to design and build your dream home are numerous. Drive by and take a look for yourself. Located in Harbour Place on Lake Tellico. Lot #84. No expense to construct a boat dock- it’s already built! Nice lakefront community. Short distance to Vonore and City of Maryville. Low HOA Fees – only $150.00 per year! Build your dream lakefront home today! Beautiful Lake lot located in Tellico Village. Build your dream home here on this magnificent Lake Lot with beautiful views. Lot is over half acre and Rip Rap is in at the shore-line. Nice mature trees with lots of privacy. Lot has deep water and also in an area for great fishing. Unique setting rigt on the lake. Mountain view from this non-dockable lakefront site. Fabulous Lakefront lot with very gentle slope to water. Dockable. Perfect for one level or basement ranch home. Build your dream home on this wonderful .58 Acre Dockable Lake lot in Tellico Village located on a Cul-De-Sac Street. Lot will accommodate a basement ranch home. Great price for a beautiful wooded dockable lake lot with views of mountains. Lot offers mature hard wood trees, great for walk-out basement. Common ground to left side of lot for privacy. Dockable waterfront lot in a gated community on the main channel of Watts Bar Lake. The lot has panoramic views of the lake and the community has a quaint clubhouse and swimming pool. The dock has TVA approved dock permit and the community is close to a new hospital and I-40. Great affordable Lakefront lot with lake access to the water (Non-Dockable). This lot is ready to build your dream home (French Providential) and fit in with the rest of these wonderful homes. WOW!! Great price for a dockable lakefront lot in Tellico Village!! Beautiful wooded sloping lot. Perfect for a walkout basement home. Short drive to all amenities, grocery store, etc. Don’t miss this opportunity!! Enjoy the privacy of this 1.63 acre wooded, lakefront on a 25 acre cove on Tellico Lake. Not accessible to the main channel, but within one mile in either direction of two boat ramps. Two marinas within 4-5 miles.